Fort Lauderdale, FL, September 04, 2018 --(PR.com)-- Mobility City has announced franchise opportunities for its business model to expand across America. With the help, support and guidance from Chris Conner, its president, and Franchise Marketing Systems Mobility City was able to build a comprehensive and solid franchise business model. “Franchise Marketing Systems provided us the tools for operations, training and on-going support. They also helped us in marketing, financing and a successful rollout,” says Diane Baratta of Mobility City. 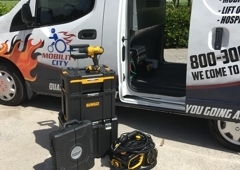 Mobility City offers mobile repair and cleaning service for mobility items including wheelchairs, mobility scooters, power chairs, lift-out chairs, rolling walkers and hospital beds is headquartered in Ft. Lauderdale, Florida. Mobility City, which has been a family business since its inception, is looking for partners from all over the country. The CEO, Diane, says the company was birthed out of need. “My late husband was dependent on his mobility scooter and lift out chair during the last years of his life. One afternoon when we were living in South Florida he was coming home from the dialysis center when his mobility scooter broke down about a mile from our home in the middle of a rainstorm. It took me days to find someone to come to my home and fix it, that was unacceptable.” They started the company after this incidence to ensure that veterans, seniors, injured and the disabled had options and remained mobile with services at your home. New franchisees will get the full support of management in setting up and replicating the original business model. They will be trained by a team that has over 30 years in the industry to develop a sound business model using state-of-the-art technology systems and they will also get a deeper understanding of the health industry to see how it relates to good working and clean mobility products. Mobility City also does repairs to ensure users are always mobile. For this, the company has been nicknamed the “AAA of Wheelchair repairs.” The company cleans wheelchairs professionally to make them comfortable for users who spend on average 18 hours a day in them. The investment, including franchise fee, ranges from $89,450 to $169,450.00, with a package that includes focused training at the head office and the site as well as ongoing support. The organization is encouraging veterans to apply for the opportunity by giving them heavy discounts. The mobility business is a multi-million-dollar industry that generated $6.8 billion in sales of wheelchairs, scooters, and other mobility items alone. There are over 3.6 million wheelchair users who need repair and cleaning services. "There are millions of wheelchairs to be repaired and cleaned, we are working with hospitals, nursing homes, assisted living facilities, airports, stadiums and big box retailers," says Diane. Franchisees will learn repairs of all mobility products, “steam cleaning” that is a specialty of the franchisor, as well as gain access to suppliers of premier mobility products. Protected territories are well marked to ensure that each franchisee is serving an area with enough clients without unnecessary competition.